Actual high resolution images are much sharper. 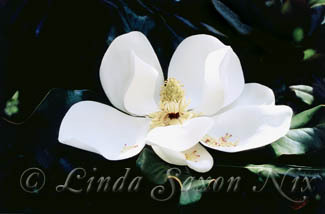 Water drops glistening on petals and leaves make this magnolia look fresh and crisp. 35mm Film image, scanned to digital. 35 mm Image. Curved shape of tepals is unique. Available in up to 8" X 10" size. This blossom is nearly open. It has excellent symmetry. 35 mm Photo - Scanned and digitally enhanced around edges. 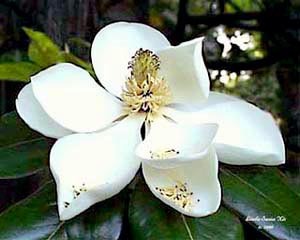 A strong, beautiful speciman of an open magnolia. 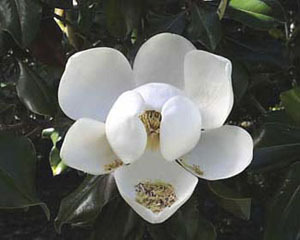 Almost perfect symmetry in this magnolia which is as round as a full moon. 35 mm Image. When just a hint of an opening bud is desired. Classically perfect... 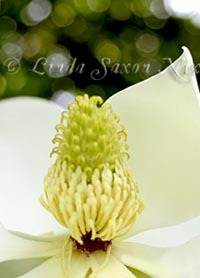 The smooth texture on the petal is like velvet! The leaves are in the background, but the exposure is perfect to showcase the blossom. 35mm Photo Image; negative available for scanning, reprints and enlargements. Actual colors more vibrant than shown here. 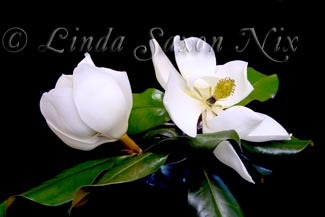 Elegant and timely, these two magnolias are displayed on a black background. Another one that unfurled in almost perfect symmetry. Digital Image. Negative not available; 35mm photo available for scanning. File not available at this time - it will return. 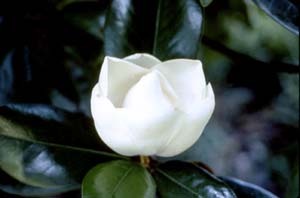 Unfurled to display elegant petals. This is a digital image only. Not available in very large file size. Quite popular as a fine arts image in a mat and frame. 35mm Image. 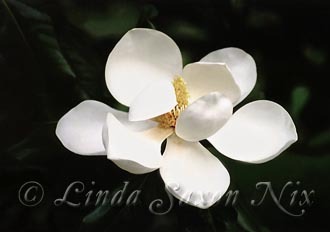 Negative available for scan, reprints, enlargements, digital scans. 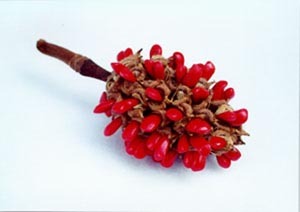 Excellent image depicting the ripe seeds of the magnolia pod. 35mm Still-life Image. Prints available. 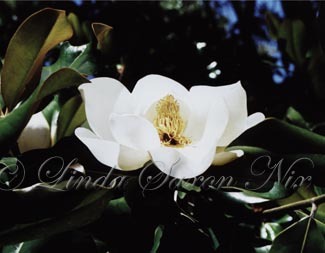 Negative available for scan, reprints, enlargements, digital scans. 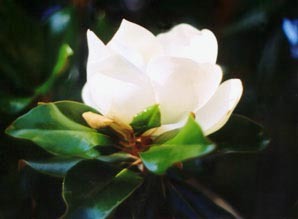 A most unusual pose of a blossom opening, caught with sunlight on the leaves. 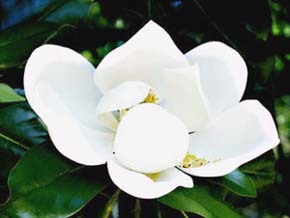 Very ripe stamen has just fallen off and has attracted a bee on a petal of this perfectly formed magnolia. Large sizes available by custom order. 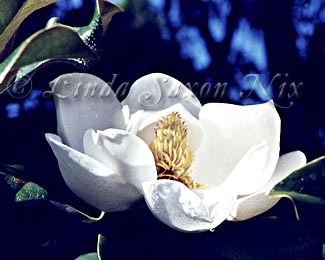 Images © 1999-20010 by Linda Saxon Nix. 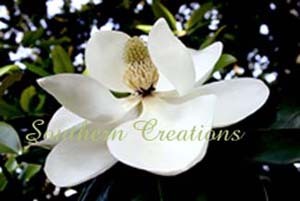 Unauthorized use of any magnolia photographs on any of these web pages is strictly prohibited. 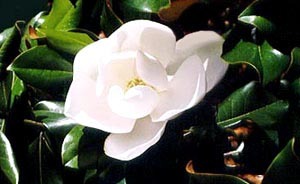 None of my magnolias are in public domain. They may not be downloaded, printed, manipulated, made into web graphics or Paint Shop Pro tubes, used on personal or corporate web pages, used as art reference, stored, reproduced electronically or digitally, used in or placed in any image or photography gallery, online or print without my explicit, written permission. 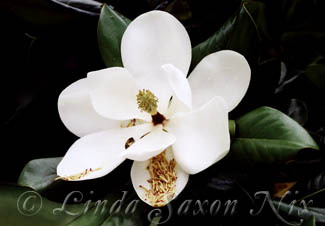 If you see anyone offering any of my magnolias in any form on the Internet, please let me know. 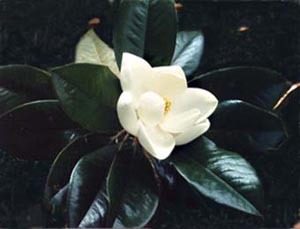 School and university students doing research and reports on magnolias may download and print images for their reports, or use in PowerPoint Presentations or other electronic presentations for class assignments only. You simply need to e-mail me and let me know how you are using the images. You should also remember to give credit in the bibliography (as you would with any reference source), and you may not pass the image on to another person for other uses. Educational use does not constitute any use in which a profit or remuneration is made in any way connected with the use of these images. Licensing fees are required in these cases.